area. Petra Bianca is recommended for couples of all ages, who love discovering a different location every day. 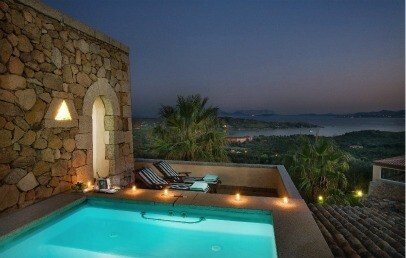 Only 8 km from the lively Porto Cervo, in a very enviable position, there is the Hotel Petra Bianca. From the hill where it lies you will enjoy stunning views encompassing all the bays and beaches that are located from 400 to 1000 meters. Only 2 km away there is the magnificent Pevero Golf Club, one of the most renowned in the world. The Olbia – Costa Smeralda Airport is 30 km away whereas Porto Rotondo is at 26 km distance. The Hotel Petra Bianca, immersed in the Mediterranean vegetation and surrounded by beautiful, perfectly tended gardens, was built in local stone and reflects the simplicity, the linear structures and the colours of the Emerald Coast for a low impact on the environment. Thanks to its location, we can say that the hotel is an oasis of tranquillity and privacy only few steps away from the sophistication and the excitement of the Emerald Coast. The 63 rooms of Hotel Petra Bianca are spread over two floors and are divided in 53 Superior double rooms with panoramic view, 8 Junior Suites, 1 Executive Suite and 1 Deluxe Suite with private pool. All of them are decorated in a tasteful and elegant style, picking up on the colours of sand and sea and, of course, offer all the modern comforts: air conditioning, hairdryer, Sky TV, safety box, minibar. The Junior Suites are more spacious than the double rooms and in addition have a Jacuzzi in the bathroom as well as a balcony or a veranda. The Executive Suite has a living room with sofas that can easily be converted into two extra beds, bathroom with bathtub and shower, large panoramic terrace or porch fully furnished and a private entrance. The Deluxe Suite with private pool is also composed of a living room with sofa bed, one bedroom, two bathrooms, furnished balcony and private pool with Jacuzzi and private entrance. The beach service is included in the price. 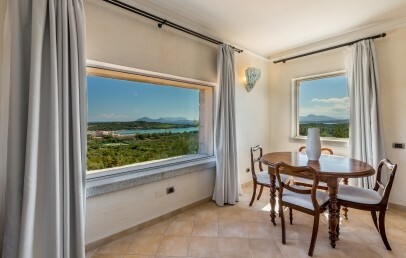 The restaurant of the Hotel Petra Bianca has a magnificent terrace with a large and impressive view over the bay of Cala di Volpe. The cuisine that the chef proposes consists of dishes typical of the local and national tradition, not without a modicum of creativity and innovation. The hotel also offers a wonderful meeting place for an evening aperitif in the piano bar with panoramic terrace and a pleasant after dinner with live music. Among the services that the Hotel Petra Bianca offers, are the pool, the gym, complimentary Wi-Fi connection throuhout the entire hotel and at a short distance from the hotel, tennis courts and golf clubs (extra charge). For sport lovers, in particular, golf players, the hotel offers special packages with accommodation, green fees and transfers. 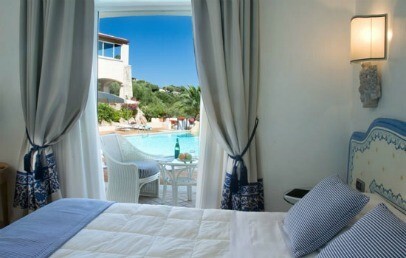 Double room decorated in a tasteful and elegant style, picking up on the colours of sand and sea. The private bathroom has a shower and hairdryer. The Superior rooms have a balcony or a little terrace furnished with wicker chairs and face the garden or the swimming pool. Some of them have also a private entrance. Double Suite with lounge area decorated in a tasteful and elegant style, picking up on the colours of sand and sea. The private bathroom has a shower or a Jacuzzi bathtub and hairdryer. The Junior Suite have a balcony or a little terrace furnished with wicker chairs and face the garden or sea. Large Suite composed of double room and living room both decorated in a tasteful and elegant style, picking up on the colours of sand and sea. The sofa bed may host, on request, 2 people. The private bathroom has a shower or a Jacuzzi bathtub and hairdryer. The Executive Suite has a spacious and sea view terrace furnished with wicker chairs. It has also a private entrance. Exclusive Suite composed of double room and living room both decorated in a tasteful and elegant style, picking up on the colours of sand and sea. The sofa bed may host, on request, 2 people. The 2 private bathroom are with shower and hairdryer. The Deluxe Suite has a spacious and sea view terrace furnished with wicker chairs and with a private swimming pool. It has also a private entrance. 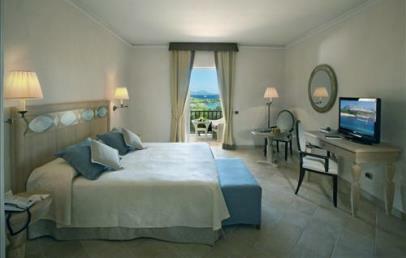 Double room decorated in a tasteful and elegant style, picking up on the colours of sand and sea. The private bathroom has a shower and hairdryer. 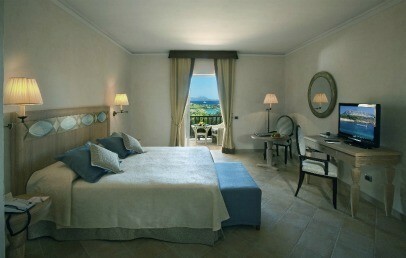 The Superior rooms have a balcony or a little terrace furnished with wicker chairs and face the sea. Some of them have also a private entrance. 20% reduction for stays from April 19th to 30th (min. 3 nights)! Free shuttle service to the beach and to Pevero Golf Club from May, 20th to September, 20th! Special gift for Charming's guests: a free dinner per stay (3 courses: starters, first and second courses, beverages not included) if you book minimum 7 nights. The meals for the baby (0 - 1 y.o.) are to be paid locally, à la carte.